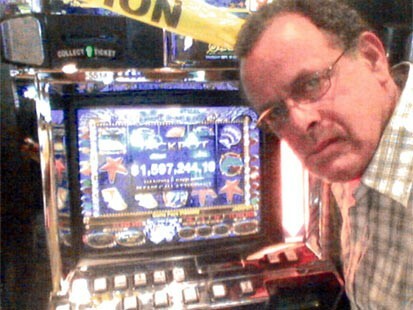 The machine’s screen shows that he just hit a whopping $1.6 million jackpot on a Mystical Mermaid nickel slot machine. Quite how this reel combination triggered a jackpot, I’m not exactly sure. Any major payout on a video slot machine is going to need five adjacent identical symbols. Even with some of the wacky winning ways on a 20-line machine (this game shows the mess of win lines about as clearly as you could hope for) I can’t see anywhere that a row of five could be possible, even if it used wild symbols. Usually a seven-figure jackpot would require something very specific like five wilds right along the middle pay line, and that’s definitely not the case here. How the jackpot was hit isn’t the big issue here anyway. This machine has a maximum payout of 50,000 coins, equal to $2500 in nickels, and it wasn’t (and in fact cannot be) linked to a progressive jackpot meter. Clearly something broke. The legend printed on all slot machines is "Malfunction voids all pays and plays". The media coverage of this story insists on referring to this as "small print". I guess it’s fairly small, but it’s not exactly tucked away out of sight. It’s right above the hole where you feed your money, right next to the button you press to spin the reels, and there’s a huge lighted yellow arrow pointing to it. In the picture above, just follow the arrow verically down from his nose and this disclaimer would be in the box right underneath the tip. If you play slots you’ll have seen it many times, but in this case, it’s common sense anyway. There’s no way that a machine trying to pay out a random jackpot way in excess of it’s maximum when the reels are aligned to no winning combination is anything but a malfunction and you’re not going to get paid. With no obligation to do so, the casino offered to pay Hoffman the $2500 maximum, but he declined and instead filed a lawsuit for the $1.6m. It’s the casino’s defense that’s caused the story to make national news. The incident happened at the Sandia Resort and Casino in New Mexico, which is located on a Native American reservation. The tribe is exerting their identity as an independent nation (the very reason that gambling can take place on their land at all) in order to have the case dismissed. They insist that any legal action involving an incident on their territory may only take place through their own court system and not a state court. Even though Hoffman’s case is a pointless waste of time with no chance of winning, it might not even get to be heard. Nobody seems to be quite sure how exactly you would go about suing an Indian Casino – even if you actually had a genuine grievance – if they can simply claim sovereign immunity at the first sign of trouble. "What happens here happens only if we say so" is not such an attractive proposition. However, any distrust that is generated through the publicity of this claim will almost certainly be shortlived as it is displaced by the human urge to gamble. Even Hoffman himself, pissed off and $1.6m out of pocket, has been giving Sandia plenty of action since the incident in August 2006. The casino has revealed that he has visited more than 70 times in the first six months of 2007 – nearly three times a week!